This Interactive Virtual Tour documents some of the destruction and subsequent rebuilding following Super Storm Sandy. The VR Tour includes 360 VR Panoramas and Gigapans from Matawan Creek, Keyport, Union Beach, Keansburg, Atlantic Highlands, Highlands, Sea Bright, Monmouth Beach and Ocean Grove. I began taking these images following a request from the Gigapan Project for images of Super Storm Sandy. These images were taken between 2012 - 2017. Photography and Post Production: Brian Richards. This impressionistic video journey through India is accompanied by a recital of Rag Marubihag by Deobrat Mishra (Sitar) and Prashant Mishra (Tabla), recorded at the Mishra home in Varanasi. Photography: Brian Richards and June Poster. Videography & Post Production: Brian Richards. This multimedia virtual tour was inspired by the photographic book and project “Thirty Three Doors, La Casa del Sol” created by Giovanni Savino from an extensive body of work in the Dominican Republic.The multimedia virtual tour and guided tour video were designed and created by Brian Richards. 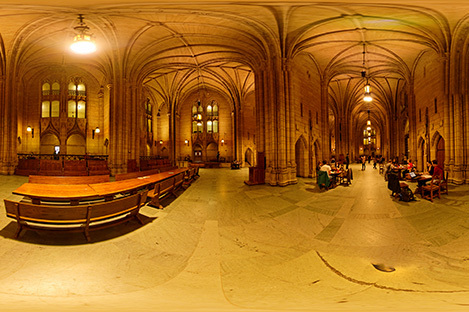 This multimedia virtual tour of the VASSAR Campus, includes 60 VR Panoramas, augmented with photo galleries and videos. The Virtual Tour was designed and created for Vassar by Brian Richards in collaboration with Mark Fink who shot and processed the 360 HDR Photographs. This multimedia virtual tour of the Cathedral of Learning ~ University of Pittsburg was designed and created by Brian Richards. Music 'Maid with the Flaxen Hair' by the Slovak Radio Symphony Orchestra.